We decided to split up today. Janell and the kids hung around Krakow and I made a trip to Auschwitz. I had some trepidation at going, but felt it was important to do so. Brief history: Operated from May 1940 to January 1945, the Germans initially held Polish political prisoners in the camp. However, from the spring of 1942 Auschwitz became the largest site for the murder of Jews brought here under the Nazi plan for their extermination, as well as Gypsies, Poles and Soviet soldiers. More than 1,100,000 men, women, and children lost their lives here. The count is inexact, especially for the Jews as they were generally killed upon arrival and not registered as were the others kept for forced labor. The laborers rarely lasted more than 3-4 months due to lack of food, exhaustion and disease. The tour was very sobering and our guide did a great job of telling the tragic story. I took relatively few pictures out of respect for those that died, but have uploaded a few. The black and white ones are one’s I took today, but edited for effect. See the rest at the Poland tab (links to Picasa on the web) to the lower right. 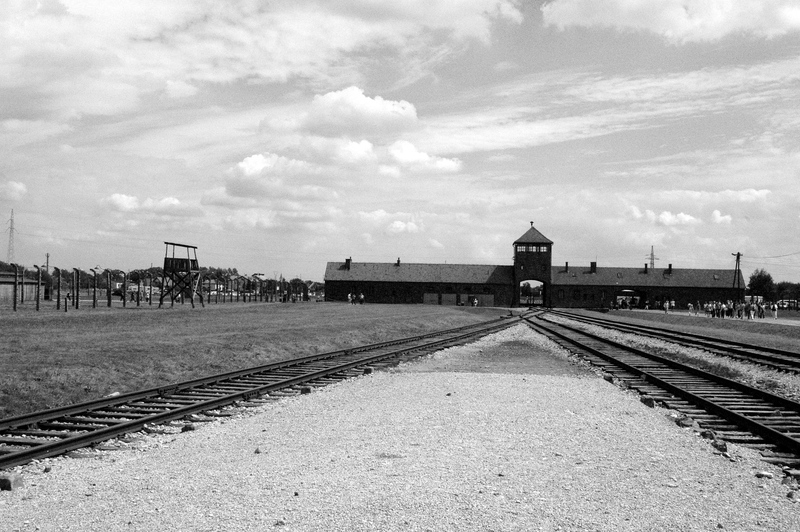 This entry was posted in Featured, Kevin's Korner, Travel and tagged Auschwitz by Kevin P. Bookmark the permalink.